Imagine a never-ending voyage where the wild air invites you to discover the pleasures of life anew. This is what Quintessentially, the world’s finest floating private club promises to do — in the year 2019. British concierge company, Quintessentially One, is building a £250million superyacht for an elite billionaire's members-only club. The superyacht will be a 722 ft. long luxury ship that will offer its rich guests a chance to tour the globe — stopping in at glamorous events such as Rio Carnival, Cannes Festival etc. This yacht will be 40m longer than the current world’s biggest private vessel — Azzam, owned by United Arab Emirates ruler Sheikh Khalifa bin Zayed Al Nahyan. It has been funded by 5 anonymous billionaire friends who have paid (£8.5m) each towards the cost of building — in return for a suite. In addition to a spa, bar, library and a beach club, Quintessentially will boast 12 stunning triplex apartments located on the top decks. These apartments will be available for sale only to the rich and privileged of the world. It will also have a boutique hotel for regular guests where the cost of a night stay will start from £2,000 (AED 9,172). Aaron Simpson, Quintessentially’s co-founder and chairman is positive that his ultra-luxury venture will travel the globe to where the wealthy want to go and be seen. It is due to make its maiden voyage in 2019-2020. 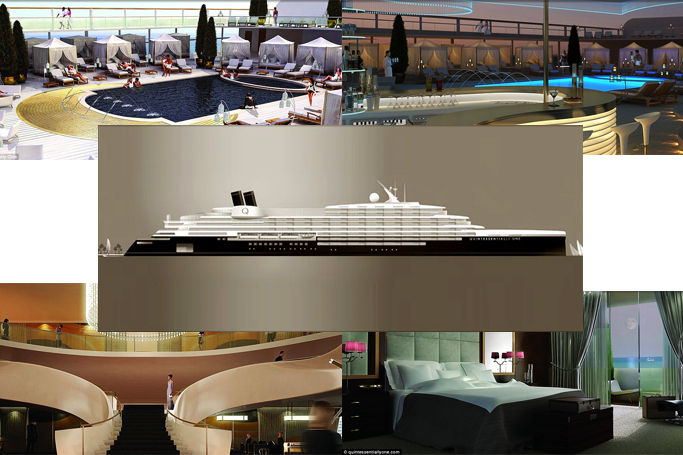 Take a look at some of the blueprints of what, we reckon, will be the most luxurious floating club of our times.